I'll tell you the truth. I've never been very good at reviewing games that aren't in English. I mean, I don't want to give a good game a bad score simply because I have no idea what the story is or how to navigate through the game. It is my opinion, however, that maybe they're kind of like dark mazes. You may not be able to see where you're going, but you can still have a good time! Although, at one completely dark maze I went to for Halloween, a girl fell through the floor. So there's mishaps and frustrations, but once you kind of meander around and push on everything, eventually you'll find your way to the exit one way or another... just hope it's not through the floor. The first thing that drew me to Hatena Satena was the artwork. I saw the cute little blue alien thing and thought, "I have got to see what this game is about." And so here we are! The artwork is adorable! The company responsible for this "aww"-inspiring game is a place called Super Lovers. If that name doesn't perk your ears, then maybe you need to get your ears checked. No, I'm not talking about the anime that I accidentally stumbled across trying to find more information about the company. Super Lovers is a company that mainly focuses on extremely cutesy art. I must say, these guys did a FANTASTIC job on this game, both on the still artwork and the animation. Sometimes, it seemed a little cluttered, but that didn't bother me too much. The game itself confused me a bit at first until I found more information on it. I thought the game was simply a Picross-style game, but I was getting confused when I kept getting "exploded" on certain blocks. 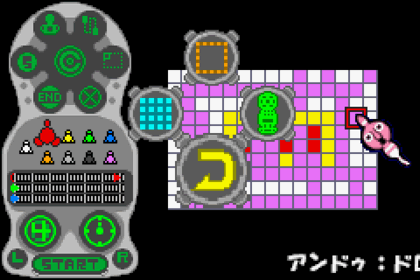 As it turns out, Hatena Satena is a game that has a mixture of both Picross and Minesweeper elements! Once I realized that, I was able to actually do a fair job in the game. I still stunk at it, but at least I knew why I was stinking%mdash;and it wasn't because of poor personal hygiene practices! Because I had no understanding of what the tutorial was explaining, I found this game to be a lot more difficult than it probably actually is. When I think of Picross, I think the numbers on the side show blocks of certain colors in a row. Such is not the case in Hatena Satena. 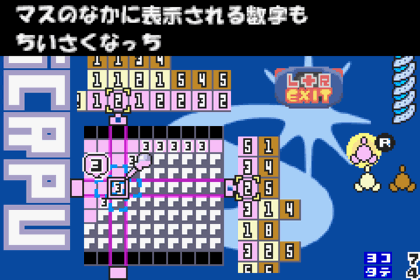 The Picross element merely shows you how many blocks of that color are present in the row. That doesn't necessarily mean they're side by side, though. That's where the game got me! Once you put down correctly colored blocks, you'll see numbers pop up for a certain number of them. That's where the Minesweeper element kicks in. You remember Minesweeper, right? The game where you randomly click blocks and hope you don't get "blown to smithereens". The number on those Picross blocks tells you how many other blocks of the same color are connected to it. Therefore, if you're in a corner block and the number pops up 2, you know that the block directly at its edges are the same color as that block. My only complaint about the game was its style of menus. To get to the levels, you had to "shoot" a super cool-looking space gun at floating objects in the sky. Just imagine Space Invaders, and you've got the menu system right there. The only thing is, I couldn't tell what the "invaders" in the menu represented... probably because I don't know Japanese. I just sort of shot random things and hoped for the best. At one point, I'm pretty sure I found a story line! I only wish there was an English version of this game. I would probably like it so much more! Hatena Satena is a game that is good to look at and good to listen to. It's a challenging game that makes you use your brain cells! Even though it's solely in Japanese, I'm confident that over time, anyone can figure out the twists and turns of this game. It has good design elements and several level. With this being my first non-English game review, I sure picked a good game to play. Oh, I almost forgot to tell you! There's an area where you can draw and design your own block pictures! Cool, huh?